I would like to formally invite you to the Annual 2013 Raymond James Stutz Artists Open House. Below are some questions and answers about this event. For more information please visit www.stutzartists.com. The Stutz Open House is an annual event held every April. This year is extra special because it is the 20th anniversary. 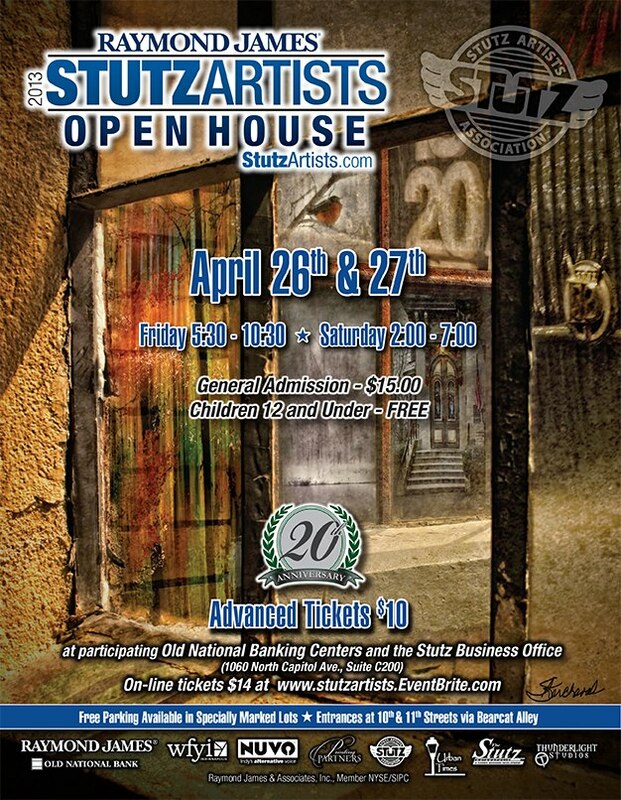 The open house is a fundraiser for the Stutz Artist Association Residency Program. The residency program gives free studios to a few emerging artists for an entire year. The open house started out years ago with just a few artists inviting their friends and patrons over for a small party and has now grown into a two day event with around seven thousand people attending every year. This year there will be over seventy artists participating as well as many businesses. This year the open house will be Friday April the 26th and Saturday the 27th. The doors open Friday at 5:30PM and close at 10:30PM. On Saturday doors open at 2:00PM and close at 7:00PM. The Stutz building is a historic car factory in downtown Indianapolis. The Stutz Motor company produced many different types of cars including racing cars at could be seen during the Indianapolis 500. Today, many businesses and artists call the building home. However, there is quite the vintage car collection that fills up a room on the second floor as well as scattered throughout the building. There are over seventy artists who will have their studios all neat and tidy with artwork on display for purchase. There will also be musical entertainment throughout the building, including jazz musician Cynthia Lane, as well as many food vendors. On Saturday there will also be children’s activities. In the Stutz Art Gallery on the first floor of the building there will be “1st Look, 20th Anniversary” which is an art exhibition that features at least one piece of artwork from every artist participating in the open house. The “1st Look, 20th Anniversary” exhibition opens on April 5th from 5:00 to 9:00PM and runs through the end of the month. It will also be open during the open house. This is a great way to preview which artists you would like to visit first. My studio is E-340 on the third floor right in the middle of the E building. Upon entry to the open house, you will receive a map of the entire building with the location of all the artists’ studios and businesses. It is a very big building with lots to see and there will be many volunteers placed throughout the building to help you find what you are looking for. Many art lovers attend both days to make sure they don’t miss anything. I have been busy creating some smaller works on paper and on canvas this year. I also have some limited edition prints available this year. 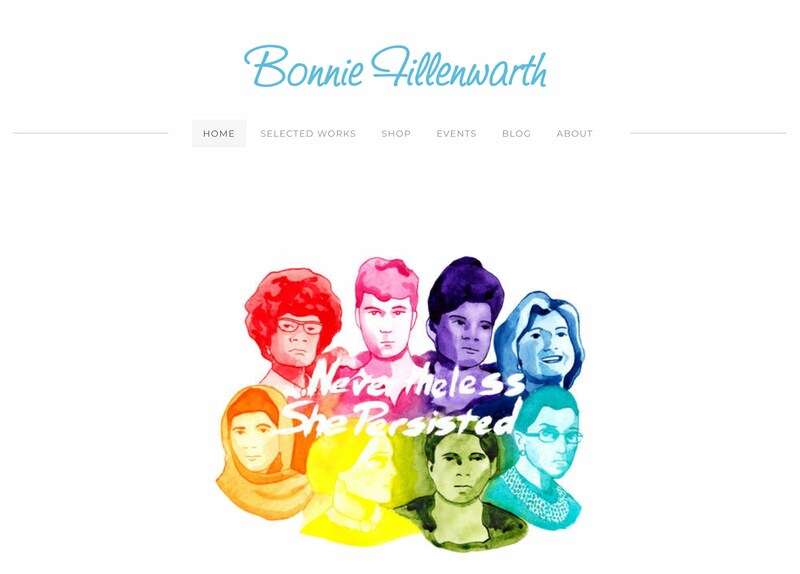 To get a preview of my work please visit my website www.bonniefillenwarth.com. You can also see my works in progress on my blog bonniefillenwarth.blogspot.com. And if that is not enough, you can follow me on Facebook, on twitter @BonnieStzE340, and on Istagram. Tickets cost $15 the day of the event. They are $10 in advance form Old National Banking Centers or the Stutz Business Center Office (317)488-7373. Children twelve and under will receive free admission with a paying adult. Saturday re-entry is free with the previous day’s ticket stub.